THE ZIONIST JEW LARRY SILVERSTEIN obtained a 99 year lease of the World Trade Center on July 24 2001 just seven weeks before the 9/11 attacks. Silverstein obtained this lease from his Jewish synagogue buddy, Lewis M Eisenberg, (who was then the Chairman of the Port Authority of New York), even though Vornado Realty outbid Silverstein by $50m. Eisenberg aborted Vornado’s bid in favour of his Zionist buddy Silverstein. Eisenberg, who was a huge contributor to the Bush-Cheney campaign, is a member of the Republican Jewish Coalition and former partner of the Jewish bank, Goldman Sachs. Silverstein and Eisenberg both held senior leadership positions with the United Jewish Appeal, a billion dollar Zionist organization. At present, Silverstein is on the UJA’s Board Of Directors. The UJA raises millions of dollars for its client, the Zionist State of Israel. Silverstein is also co-founder of the Israel Export Development Company. Of particular note, the Wall Street Journal reported that Silverstein regularly had breakfast at the WTC’s Windows on the World every morning. SCIENTISTS, ARCHITECTS, & ENGINEERS now affirm that the 9/11 destruction of the World Trade Center buildings was an inside job. The leading scientist of Scholars For 9/11 Truth, Dr Steven Jones, has proven that controlled demolition devices were placed within the WTC Twin Towers – and this is what brought the buildings down not the airplanes. Jones says that molten metal was found in the sub-basements of the buildings. The molten metal, Jones argues, was caused by a high-temperature Thermite reaction, used to demolish steel. Thermal hot spots throughout the sub basement levels were detected by satellite – confirming Jones’ findings. Jones also says that heated dust with particles of Thermite was discovered in the WTC area. 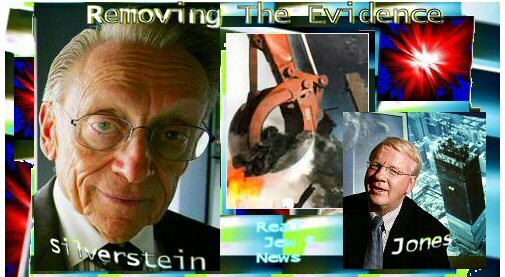 But Silverstein arranged that three NY Jewish steel and scrap companies ship the metal which could have been used as evidence to China & India. — “The chances of the buildings collapsing symmetrically into their own footprint at freefall speed by any other means than by controlled demolition are so remote that there is no other plausible explanation” — Here. 9/11 – ARAB OR ZIONIST HIJACKERS? BIN LADEN: MARTYR OR VILLAIN? Was 911 A Mossad ‘False Flag’ Operation?